Restoring freshwater flow to the Florida Everglades could help snook, one of the state’s prized gaming fish, survive extreme climate events. Researchers have spent the past seven years examining the long-term effects of two unique cold spells that struck South Florida in 2010, including different species’ abilities to recover in the Everglades. 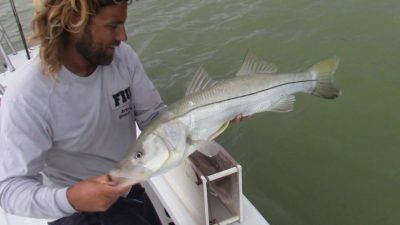 In the case of the common snook, known to be sensitive to temperature changes, the researchers found location was a key factor in the fish’s ability to survive the cold when temperatures dipped into the 30s. Biologist Ross Boucek (pictured) and a team of FIU researchers found common snook in deeper waters of the Florida Everglades survived the 2010 cold spell that brought temperatures down to the 30s. While further research is needed, these findings show freshwater flow could help push snook to warmer habitats in the short time they have before water turns lethal when a cold spell strikes. According to Boucek, water temperatures remain constant in deeper habitats. Yet, when freshwater flow is lacking, snook are often concentrated in locations far from these deep water habitats. Climate change is expected to increase the frequency and intensity of extreme climate events. According to Jennifer Rehage, FIU ecologist and scientist with the Florida Coastal Everglades Long Term Ecological Research (FCE LTER) Program, if researchers understand what keeps water temperatures warmer, and how and why snook seek refuge in those habitats, managers can understand their vulnerability and manage accordingly. Snook exposure to cold anomalies and possible lethal effects is governed not only by fish behavior, but by cold water and hot water mixing due to winds, river flow, tides and water depth, according to Tom Torgersen, program director of the NSF’s Water Sustainability and Climate Program, which supported the research. FCE LTER Program monitoring networks provided the scientists with long-term data on environmental conditions. The scientists outfitted more than 100 snook with acoustic transmitters, following their movements throughout the Everglades. Housed at FIU, the FCE LTER Program is part of the National Science Foundation’s (NSF’s) LTER Network. The study was published in Global Change Biology. It was funded by the National Science Foundation with support from the Everglades Foundation.